Welcome to my blog. 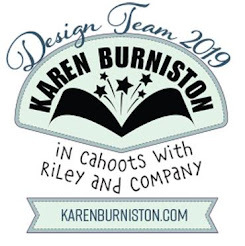 Today the Karen Burniston Design Team is collaborating with Darkroom Door, they have lots of fun stamps and stencils which work well with Karen's die sets. 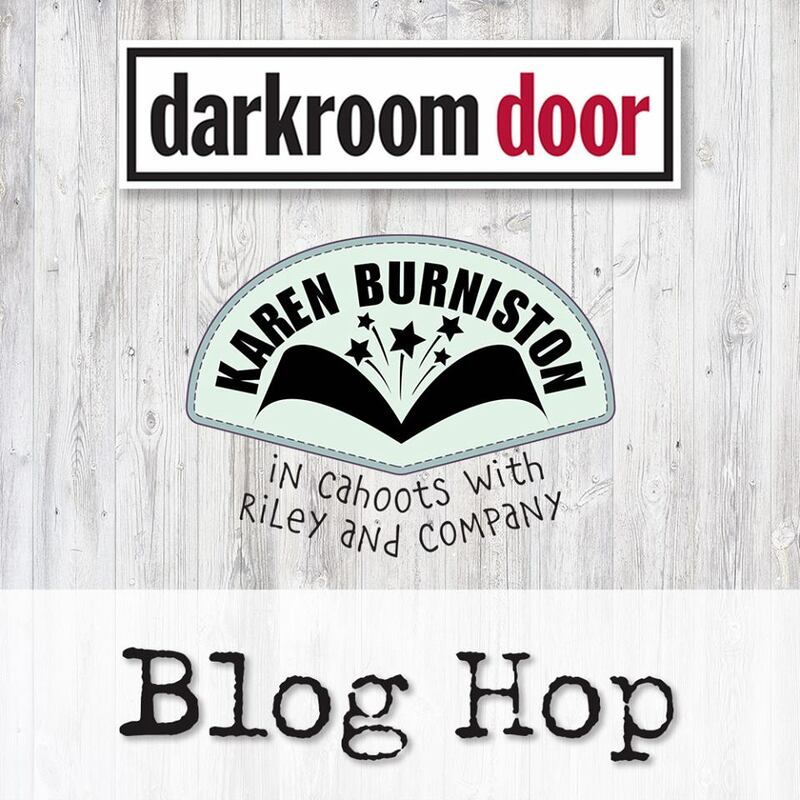 Today the Karen Burniston & Darkroom Door Design Teams have come together to hold a blog hop showcasing products from both companies. The hop started on the Darkroom Door Blog, so if you just happened to hop onto my blog you may want to head over there now so you can start at the beginning of the hop. You don't want to miss anything and there is lots to see! 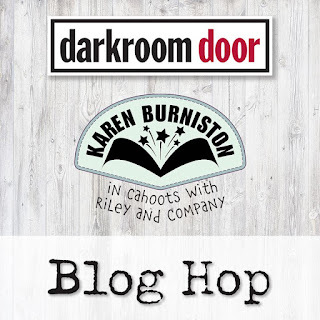 Both Darkroom Door and Karen Burniston will be giving away prize packs, with winners randomly chosen from ALL of the blog hop comments received by Sunday, July 29th, 2018. 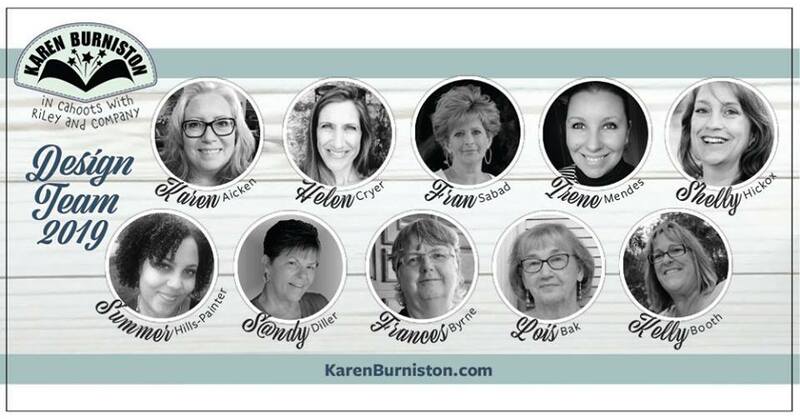 Lots of chances to win some goodies, so just leave a comment on this post or any other blog hop post to enter! For my first card, I used Darkroom Door's Coffee Stamp set to create my card. As you can see I have created a pop-up card using Karen Burniston's Cupcake Pop-up die set. For the base of the card used patterned paper and then stamped the coffee stain and coffee beans randomly over the cardstock and sponged with Vintage Photo Distress Oxide ink. I stamped the coffee cup and saucer three times onto patterned papers and cut them out. Cutting one complete with the cup and saucer and the other two just the cups. I also stamped three more of the cups using cardstock which I adhered the patterned paper cups to for strength. I cut a slit into the cups that the other cup is going to be placed into and adhered them to them. The cups were then adhered to the cupcake portion of the pop-up die cut base. For the sentiment on the base of the card I used the label dies from the Katherine Label Pop-up die set and added the "Spill the Beans!" sentiment from the Coffee Stamp set which was stamped on the fishtail flag from the Word Set 5 - Royalty die set. 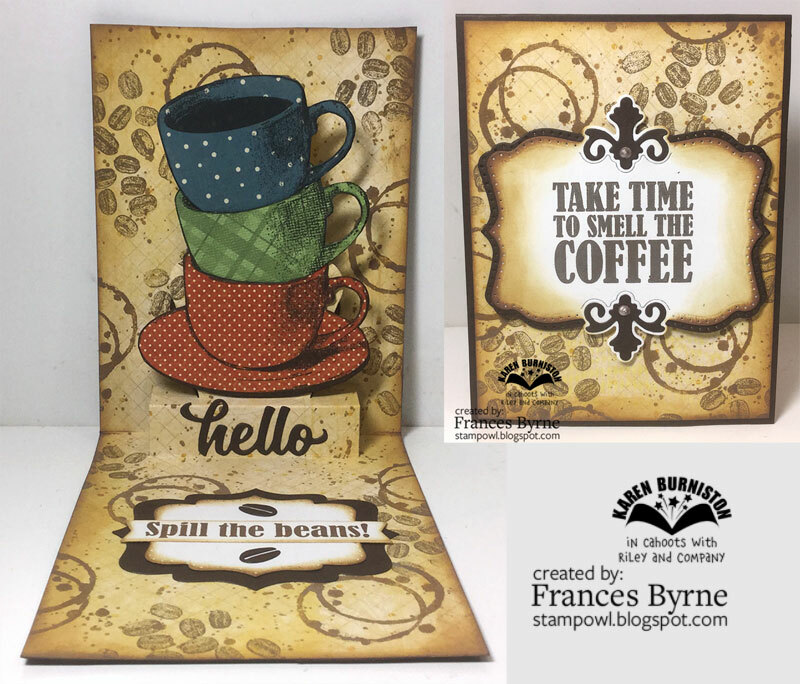 The coffee beans are from the Coffee Cup Pop-up die set. The Hello sentiment die cut is from the Word Set 6 - Summer die set. For the front of the card I created the background as I did the inside of the card. 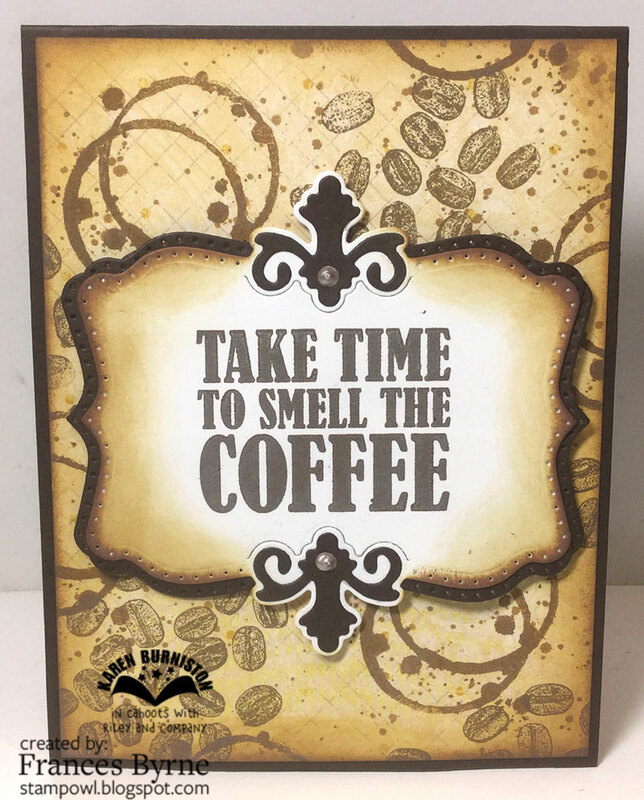 I added a sentiment also from the Coffee Stamp set from Darkroom Door, stamping this to the large label from the Gift Card Label die set. 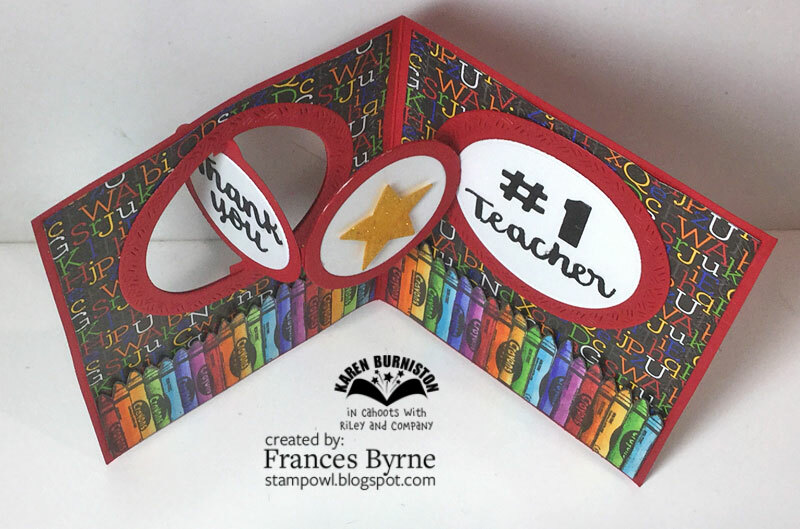 For my second card today, I have created a Teacher Thank You can to use for my grand children's teachers at the end of the year. The Crayon stamp from Darkroom Door is perfect for this. To create my card I used Karen Burniston's Circle Charm Pop-Up die set. To create the circle frame around the opening of my card I used the Crosshatch Circles die set, I love this fun die set. 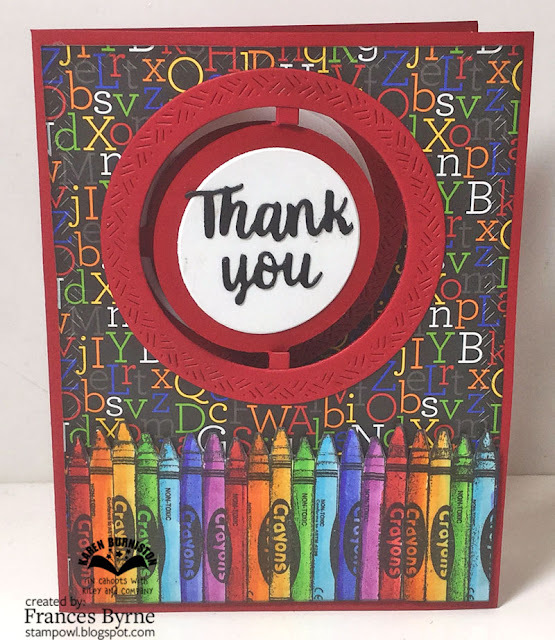 The "Thank you" sentiment comes from the Word Set 1 - Greetings die set. The "# 1" comes from the Numbers die set and the "Teacher" sentiment is a combo of varies sentiments from Word Set 2 - Birthday; Word Set 3 - Holiday & Word Set 6 - Summer. Here is one last photo of my card taken from overhead so you can see the pop-up portion of this card a little better. Well that is about it from me today, thank you for dropping by. The next stop on the hop is Godelieve Tijskens. Love the teacher card and the use of the crayons. Yes, the colouired crayons look really good. I'm not usually one for pop up cards, but this looks good. Love the cards you made. Clever and beautiful!!! Great cards Frances, as always. Love the crayons....they look so real. Interesting cards. I might try more vibrant backgrounds. Love the paper piecing on the cups and the colourful crayons really pop on the second card. Love that adorable teacher card! TFS! AWESOME cards frances...Love everything about both cards! Beautiful cards. I am becoming a fan of pop ups! Fantastic work! The coffee time stamp is about to hop off my wish list and into a cart thanks to you! Love the pop out teacher with the circle charm die. Bright fun colors. Great for an artist too. I love the crayon card. The crayons look like a fun stamp and that card is super cute with the unique fold. Your coloring is amazing. When I saw this card on Instagram I thought you had used patterned paper. Awesome cards! Love that coffee cups pop-up card, and your Circle Charm Pop-Up is fabulous! Fun colors and details! The teacher card is my favorite!!!! Gorgeous cards! Love the stack of colorful cups in combination with the (coffee)brown card. The stamps and dies go so well together on both cards! Love these beautifully designed cards! The stamps and dies work so well together. 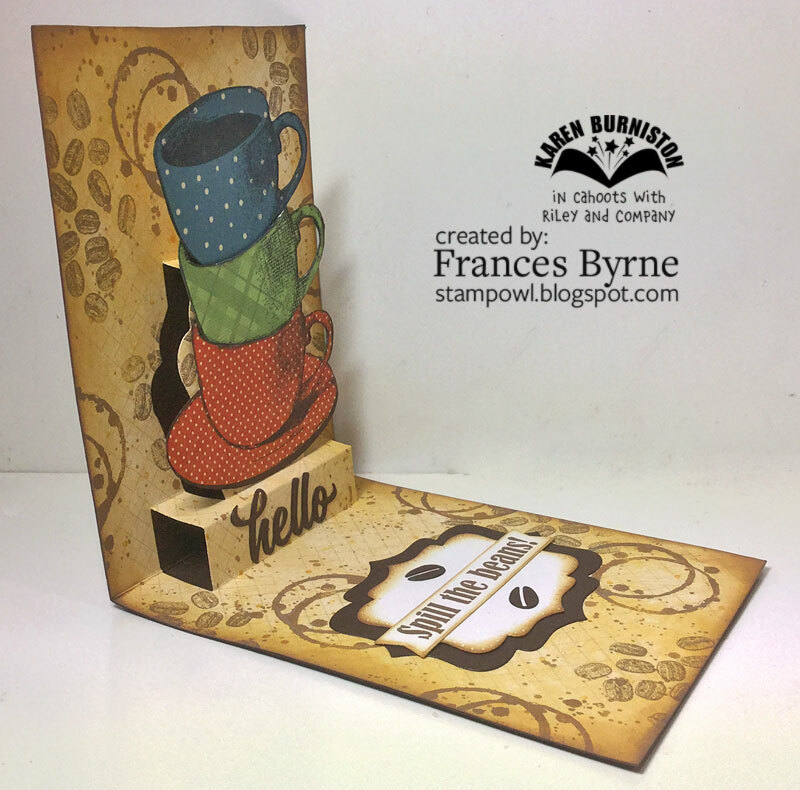 Love the crayons stamp set and your creative way to display the coffee cups using the Cupcake Pop-up die! You make it seem like these two companies' designs were meant for each other! Thanks for all the inspiration! Great cards for the Hop. I love that we both used the same crayon stamp and the Circle Charm Accordion for completely different cards. Love your cards! These are both very vibrant and pretty! Two beautiful cards! Love the coffee cups!! Great idea! Two wonderful cards. The coffee card I know of a few people who would love that card.But I really love the bright colours of the circle charm pop up card. Teachers will love it. Such cleaver interactive cards. Thanks for the inspiration. I love them both but I gotta say that you won me over with the coffee one...sooooo fabulous! Wow, awesome cards! Love the cups on top of each other. And the crayons look almost real! What a beautiful present for a teacher! Love your cards. I am all about coffee so I really like that first one. I bet any teacher would love to receive that second one! The crayons are sheer perfection! Great cards! I like both cards very much, the simplicity of spill the beans and the colorful thank you for the teacher. 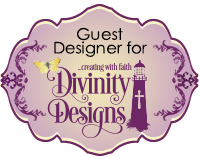 I love the idea of using patterned paper for the coffee mugs! And that teacher card is amazing- I'd be so excited to get one like that! Outsranding!!! Guess my love of coffee makes me adore coffee stamps, dies and this kind of card!! I love it, and love the idea of stamping the image on pattern paper! Love love love this card!! Wonderful as always Frances. The patterned coffee cups look great! Funny that I'd go nuts if I actually had beverage stains on any of my papers and yet, the coffee rings stamps go perfectly. Love the bright coloured crayons. I don't drink coffee but love this die set and know lots of people who drink coffee. I am a tea drinker myself. I love love love the stacked cups and saucers. It's a look anyone will like! Wonderful cards - love the coffee one, guess I just love the richness of the colors. Love the stacked coffee cups. So cute. The stacked cups are my favorite! fabulous cards - great job. Love your cards, especially the Teacher card! I can't decide which card is my favorite, between the coffee one and the crayons! 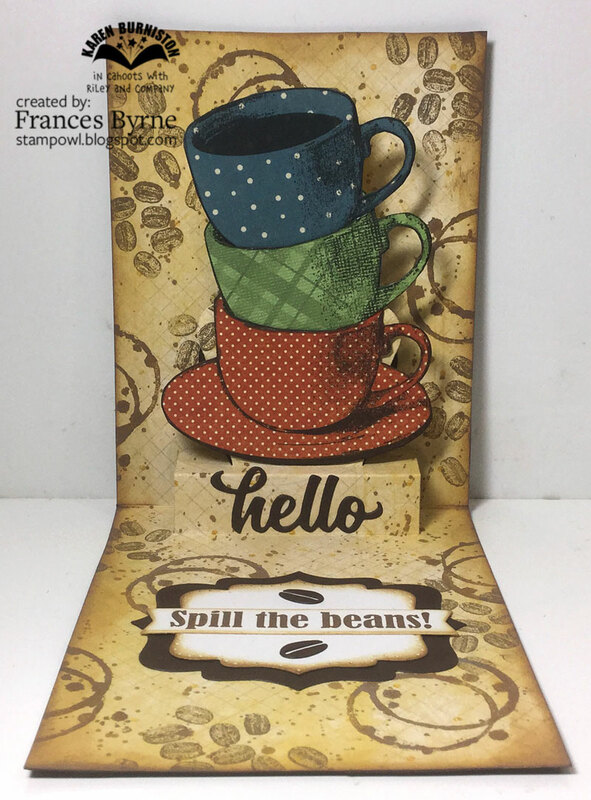 Love the stamped coffee rings and beans on your background and the bright crayon colors! Adorables cartes ! merci pour le partage ! even though I don't drink coffee...I have to say I love that coffee spill the bean card. Such simple ideas with beautiful results. I especially love the coffee card, as every element and tone is perfect! Thanks for the inspiration and the walk-through. Love these cards, especially the coffee one. love these pop out cards, the colors are amazing and the stamps...have to have them!! luv the antique-feel of your first card....and then those crayons on the 2nd!! No way! I LOVE THEM BOTH! Especially the crayon one! My sister is a teacher! Fabulous cards. The coffee card is my type of card-I love coffee. These are awesome, Frances! Love your crayons and the coffee card would be awesome for the coffee blog hop. Love these! Both of your designs are amazing, Frances, but the coffee card is near and dear to my heart! Great teacher card; any teacher would be very happy to recieve this! Great use of the cupcake die set for something else. Super cards! Love the spill the beans sentiment. I always enjoy your creations. love the color combos and that teacher card is awesome. Two great cards! I work in a school and teachers would really appreciate the colorful one you made. Great cards. Love the coffee theme and paper pieced cups on the first one and the colorful crayons on the second. Amazing cards! Such rich colors and designs. What fun cards you made. The crayon card is just amazing with all those colours. Two wonderful cards, love the first one especially!!! love, love, love both of these cards! I am loving seeing all these inspiring cards!